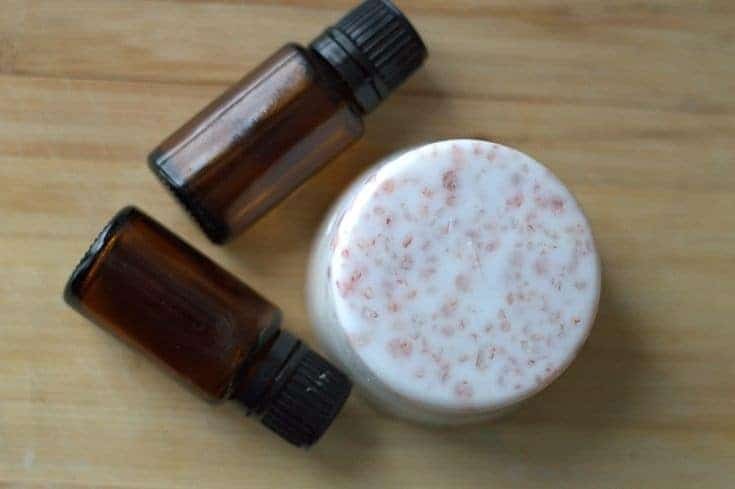 This DIY exfoliating soap recipe is a great all-natural way to pamper yourself, as well as make affordable gifts. 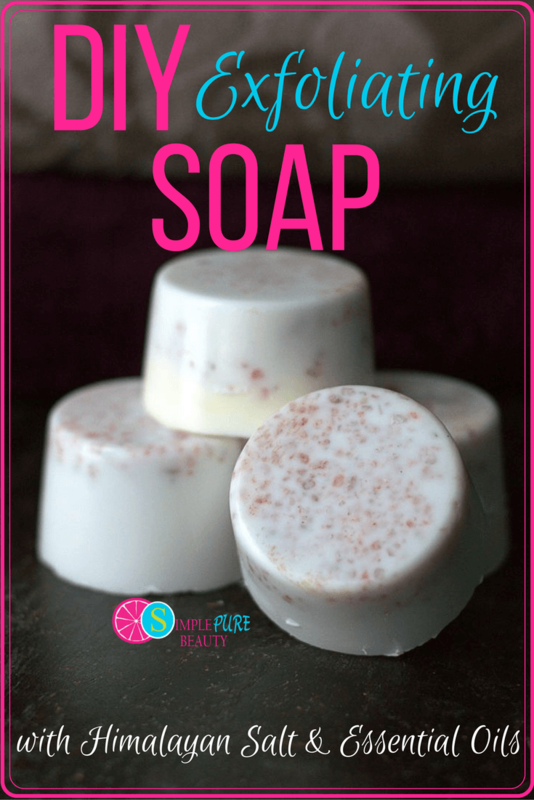 Choose your favorite essential oils to create your own personalized soap! The number of huge, unreadable ingredients found in store-bought cleaners and personal care products seems to be growing with every new bottle I pick up! For this reason, I have been making an effort to swap out these store bought products with easy homemade recipes whenever possible! As a self-proclaimed essential oil enthusiast, of course I include essential oils in all of the DIY cleaning and beauty recipes that I make! Some of my most successful recipes have been homemade relaxing essential oil soap, moisturizing essential oil body butter & foaming hand soap! While I think DIY recipes are great, I do not have a lot of patience to make them. So that means if you are getting a recipe from me you can be assured that it will be quick and easy to make! Today I wanted to share my recipe for DIY exfoliating soap with the exfoliating ingredient being Himalayan salt. This is a great all-natural way to wash & exfoliate your skin and leave it feeling soft and nourished. This is a great soap to add to your bathing routine every other day. Using this soap daily could result in skin irritations as the Himalayan salt is quite coarse. Without further ado, let’s get to the recipe! Cut soap base into 16 squares and place in a 2-cup glass measuring cup. Microwave for one minute; take out and stir (be careful, it's hot!). Microwave in 30 second intervals, stirring in between, until soap basehas completely melted. Pour approximately 1/2 cup of melted soap base into a deep silicone muffin mold (this one holds 1/2 cup in each cavity). You should get four bars; don't fill right to the top of the mold. Add 5-10 drops of Essential Oil into EACH bar and stir, making sure the oil is well integrated. Add 2 Tablespoons of Himalayan Salt to EACH bar; stir, and let settle. Let stand until the soap has cooled and is firm. You can leave it on the counter overnight or you can place it in the fridge for approximately 30 minutes. The Himalayan Salt will have settled at the bottom of your soap, allowing you to use one side for exfoliating and the other side for a nice lather without the exfoliation. As I mentioned before, be sure to only use this bar every other day to ensure that your skin does not become irritated from the coarse Himalayan salt! You can also switch up the essential oils you use in each batch! In my relaxing essential oil soap I use cedarwood and lavender as they are both calming oils and are perfect to use before bed. If you plan to use these bars in the morning, consider using invigorating essential oils such as peppermint or citrus. You can also just choose the scent you like best! That being said, I would avoid using warm/hot oils as using them on sensitive areas will not be a pleasant event (trust me I speak from experience)! 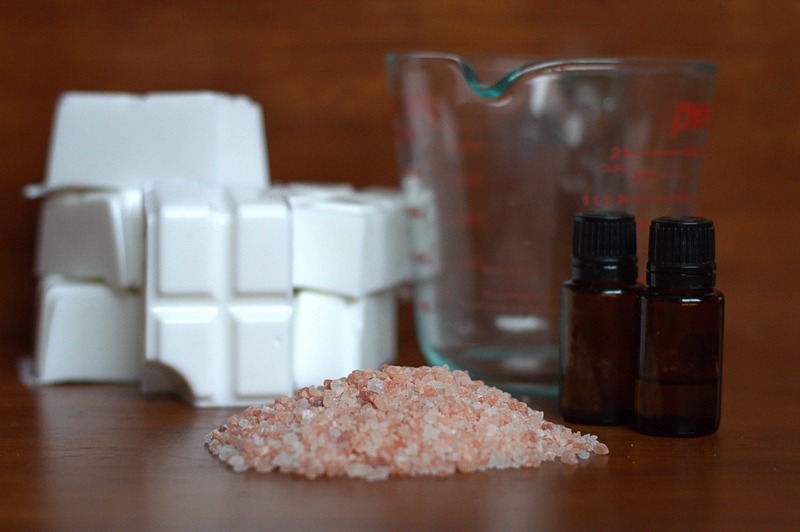 You are all set to make your own DIY Exfoliating Soap with Himalayan Salt & Essential Oils! These bars are perfect as an inexpensive gift and for pampering yourself, of course! 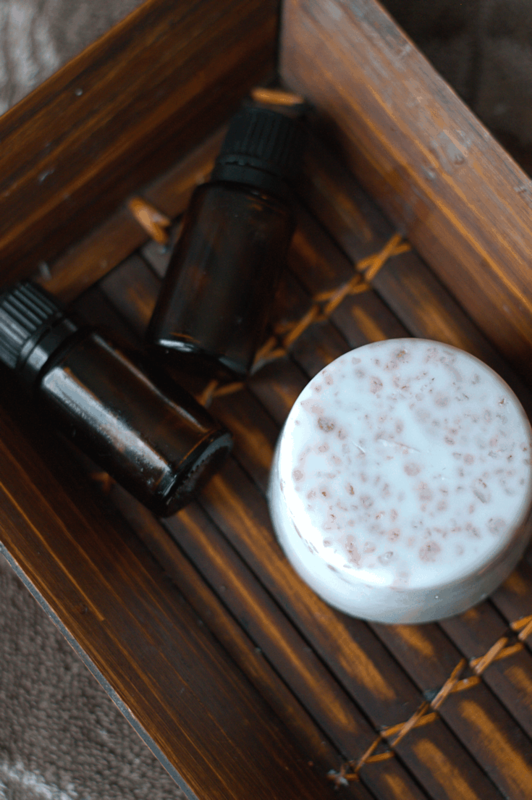 What essential oils will you use in your DIY exfoliating soap? Chantal has a passion for spreading awareness and sharing information about essential oils, mental health and chronic illness on her blog Painted Teacup! When she isn’t blogging Chantal enjoys spending time with her husband and their fur-baby, working as a social worker and helping her husband with the family virtual assistant business! You can connect with Chantel on Facebook, Instagram, Twitter, and Pinterest. Thanks for the “warm” oils tip. What oils would be considered “cool”, all that weren’t mentioned, i.e., peppermint, lavender, citrus, etc.? I have used Rose Absolute, Frankincense EO, and Lavender EO. If you want a floral, I think Clary Sage or Bergamot & Ylang Ylang would be nice. Just stick to the correct usage rates. Aromaweb.com has good info on usage rates. I have made these soaps before also using the Shea Butter M&P. I have even tried using the finest grain pink salt available. But, no matter what, it does always sink to the bottom. I am wondering if the clear suspension M&P bases would provide a more even distribution of the salt. Anyone have experience with this?